Procon Technology is now supplies state-of-the-art LED (Light Emitting Diode) and Harsh Environment Power Supplies approved for use in Australia. Please see prices below and email us for quantity requirements or special applications. OEM, wholesale or trade discounts are available. These power supplies can be used in harsh environments for a variety of applications! In Australia, call 03-98306288 now to buy! Meanwell, also provide industrial power supplies from 15W to 10000W, mains power adapters from 12W to 280W, Battery Chargers (including UPS), DC-DC Converters, DC-AC Inverters. and Medical Approved Power Supplies. ELG Range (above left) - lower cost, metal case type... 5 YEAR WARRANTY! The Meanwell ELG series provides 75W, 100W, 150W, 200W or 240W output at 12V, 24V, 36V, 42V, 48V, 54V DC. Other voltages are available by adjustment potentiometer (option A type). All units provide constant current operation down to 50% of the nominal voltage. The ELG series is IP65 or IP67 rated for use outside or inside in wet areas and can be supplied with V & I adjustment option A (using internal pots) or dimming option B (using external 0-10V, PWM or 100K pot). A DALI interface option (DA) is available for a small additional cost. The entire range features; free-air cooling, built-in active PFC (Power Factor Correction) and Short Circuit (SCP), Over Current (OCP), Over Voltage (OVP) and Over Temperature Protection (OTP). NOTE: Derate the output for all ELG units when operated at less than 190VAC (for 100% output down to 100VAC, purchase the "U type"). A smart timer dimming function (option D2) is also available with user programmable dimming over time. This allows the ELG to be turned on early evening in a dimmed state, rise to full intensity and then dim again late at night in order to save energy and lengthen the life of the LED lamp. Also available on special order is the BE option for the ELG-150, providing 3 in 1 dimming and 15V 0.3A aux. voltage. HLG Range (above right) - Harsh Environment type... 7 YEAR WARRANTY! The Meanwell HLG series provides 40W, 60W, 80W, 100W, 120W, 150W, 185W, 240W, 320W, 480W or 600W output at 12V, 24V, 30V, 36V, 42V, 48V, 54V DC. Other voltages are available and, with adjustment (option A type), battery voltages such as 13.8V, 27.6V, 55.2V are possible. The 100W to 185W, 480W and 600W models are constant current limited down to zero volts and are suitable for driving motors and charging lead-acid batteries etc. Constant current operation (e.g. 700mA, 1400mA, 2800mA or 5600mA) is also possible with the A or B option (max. voltage 58V). The HLG series is IP65 or IP67 rated for use outside or inside in wet areas and can be supplied with V & I adjustment option A (using internal pots) or dimming option B (using external 0-10V, PWM or 100K pot). A new time controlled dimming Option D (m.o.q. or self-programmable) is available that can provide significant energy savings! The entire range features; free-air cooling, built-in active PFC (Power Factor Correction) and Short Circuit (SCP), Over Current (OCP), Over Voltage (OVP) and Over Temperature Protection (OTP). The HLG range can also be used in industrial or other applications where an enclosed "safe" power supply is required in tough environments. Operating temperature -40°C to 60°C without derating (up to 70°C with derating). 7 year warranty. The HLG can be used to replace the Amtex DLG-50/70, DLG-100/150, LXV-300 and many other units! NEW! The DAP-04 can be used to control many "PWM dimmable" (HLG option B) LED power supplies from one PUSH-DIM control or up to four addressable channels through the DALI interface. The HLG range, with option "B", can also be controlled from the Clipsal C-BUS using a 0-10V analogue output module L5504AMP. APV-12-v, 12W SMPS v = 12V, 24V $27.00 $29.70 . APV-16-v, 16W SMPS v = 12V, 24V $30.00 $33.00 . LCM-25DA, 25W SMPS 350 to 1050mA with DALI interface $70.00 $77.00 . PCD-16-aB, 16W SMPS 240VAC, a = 350mA, 700mA~...... pdf $50.00 $55.00 . PCD-25-aB, 25W SMPS 240VAC, a = 700mA~ $54.00 $59.40 . PLM-25E-a, 25W SMPS a = 350mA, 700mA, 1050mA~ $30.00 $33.00 . PLN-20-v, 20W SMPS v = 12V, 24V~.................................. pdf $50.00 $55.00 . PLN-30-v, 30W SMPS v = 12V, 24V~ $60.00 $66.00 . PLN-60-v, 60W SMPS v = 12V, 24V, 27V~ $80.00 $88.00 . PLN-100-v, 100W SMPS v = 24V $100.00 $110.00 . LPF-25D-v, 25W SMPS v = 12V, 24V $70.00 $77.00 . LPF-60-v, 60W SMPS v = 12V, 24V... constant voltage output! $80.00 $88.00 . LPF-60D-v, 60W SMPS v = 12V, 24V, 36V $90.00 $99.00 . PWM-60-v, 60W SMPS v = 12V, 24V~ $90.00 $99.00 . XLG-25-n, 25W SMPS v=22V..54V, c=0.5A..1.05A, n = A, AB $60.00 $66.00 new! XLG-50-n, 50W SMPS v=22V..54V, c=1A..2.1A, n = A, AB $70.00 $77.00 a.s.
XLG-100-m-n, 100W SMPS m = 12, 24, L, H... n = A, AB . . a.s.
HLG-60H-vn, 60W... v = 15,20,24,30,36,42,48,54V... n = b, A, B $80.00 $88.00 . CLG-60-v, 60W... v = 12V, 24V~ (now with Australian plug)... pdf $90.00 $99.00 . HLG-80H-vn, 80W... v = 12,15,20,24,30,36,42,48,54V... n = ? $90.00 $99.00 . CLG-100-v, 100W... v = 24V (now with Australian plug) $120.00 $132.00 . CLG-150-v, 150W... v = 12V, 24V (now with Australian plug) $125.00 $137.50 . HLG-240H-vn, 240W... v = 12,15,20,24,30,36,42,48,54V... n = ? $140.00 $154.00 . HLG-320H-vn, 320W... v = 12,15,20,24,30,36,42,48,54V... n = ? $200.00 $220.00 . 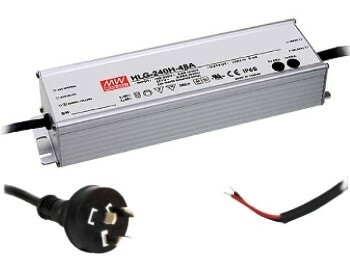 HLG-480H-vn, 480W... v = 24,30,36,42,48,54V... n = b, A, B $300.00 $330.00 . HEP-600-v, 600W... v = 12,15,20,24,30,36,42,48,54V... V+I adj. $450.00 $495.00 . ELG-100-Ccn, 100W... c = 350,500,700,1050,1400mA... n = ? $90.00 $99.00 . ELG-150-Ccn, 150W... c = 500,700,1050,1400,2100mA... n = ? $100.00 $110.00 . ELG-200-Ccn, 200W... c = 700,1050,1400,1400,2100mA... n = ? $110.00 $121.00 . ELG-240-Ccn, 240W... c = 700,1050,1400,1400,2100mA... n = ? $120.00 $132.00 . HBG-200-vn, 200W... v = 36V, 48V, 60V... n = b,A,B,DA $180.00 $198.00 . PLP-20-v, 20W SMPS v = 12V, 24V, 48V~ $36.00 $39.60 . PLP-30-v, 30W SMPS v = 12V, 24V, 48V~ $36.00 $39.60 . PLP-45-v, 45W SMPS v = 12V, 24V, 48V~ $40.00 $44.00 . PLP-60-v, 60W SMPS v = 12V, 24V, 48V~ $45.00 $49.50 . LDD-cLn, module c = 300, 350, 500, 600, 700mA... n = bWS $12.00 $13.20 . LDD-cH, PCB module c = 300, 350, 500, 600, 700, 1000mA $12.00 $13.20 . LDD-cHW, wired module c = 300, 350, 500, 600, 700, 1000mA $14.00 $15.40 . LDD-cHS, SMD module c = 300, 350, 500, 600, 700, 1000mA $15.00 $16.50 . LDD-cHn, module c = 1200, 1500mA... n = bW $22.00 $24.20 . LDD-cHn, module c = 350,700,1050,1400mA with DALI... n = bW $27.00 $29.70 new! LDH-45n-cWDA, 45W c = 350,500,700,1050mA... with DALI $36.00 $39.60 new! UHP-200A-v, 200W SMPS v = 4.2V, 4.5V, 5V... @40A $120.00 $132.00 . UHP-350n-v, 350W... v = 3.3,4.2,5,12,15,24,36,48V... n = b, R $180.00 $198.00 . HDP-190, 190W DUAL SMPS v = 2.8V@22A, 3.8V@40A $200.00 $220.00 . HDP-240, 240W DUAL SMPS v = 2.8V@28A, 3.8V@50A $200.00 $220.00 . DLP-04R, Bus power supply 16V@0.24A for DALI interface $80.00 $88.00 . KAA-4R4V-10, KNX LED actuator/dimmer - 4 channel (10A) $400.00 $440.00 new! KAA-8R, KNX universal actuator/controller - 8 channel (16A) $450.00 $495.00 . KAA-8R-10, KNX universal actuator/controller - 8 channel (10A) $360.00 $396.00 . KNX-40E, 40W DIN SMPS 30V@1280mA with/without choke . . u.d. KSC-01L, KNX LINE coupler . . u.d. KSI-01U, KNX to USB interface (bi-directional, isolated) $360.00 $396.00 . SPD-10-320S, Surge Protection Device 320VAC 10kA $25.00 $27.50 m.o.q. SPD-20-240P, Surge Protection Device 240VAC 20kA $25.00 $27.50 . SPD-20-277P, Surge Protection Device 277VAC 20kA $30.00 $33.00 m.o.q. SPD-20HP-480S, Surge Protection Device 480VAC 20kA $54.00 $59.40 . DLP-04L, Bus power supply 16V@0.24A for DALI interface $80.00 $88.00 . ~See data-sheet as units marked "~" have a high ripple! The PWM series has Pulse Width Modulated output! b(blank)=IP67 with V+I fixed. A=IP65 with V&I pot adjust. B=IP67 with I adjust externally. + the HLG-100 to HLG-185 models provide constant current down to zero volts. Delivery charge within Australia $11 (trade & express bag orders - $16.50). More for discounted orders or large orders to WA, NT and remote QLD. Delivery to all overseas destinations - P.O.A. (ask us). EX-GST purchases may only be made when the delivery address is outside of Australia. i.e. for EXPORT orders. Prices subject to change without notice. 1. Applications include - street lighting, message boards, down lighting, channel letter lighting, halo letter lighting, sign cabinets, light boxes, accent lighting, traffic lights, traffic signs, stage and theatre lighting and many other lighting possibilities. Can also be used for general outdoor power supply applications including battery charging etc. Note, local electrical authority approved types can only be used in domestic applications. However, many international approved (UL, CB, CE, TUV, EMC) types are available for industrial applications! 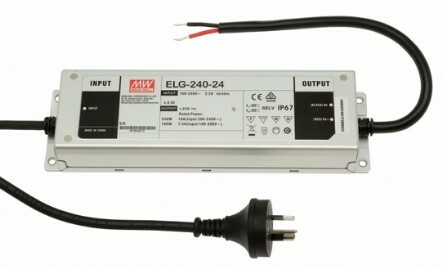 The approved LED power supplies will have ADM appended to the part name. 2. For a copy of the Meanwell LED catalogue - click here - showing the full range, a comparison chart, applications, accessories and new products. 3. For more information on LED design and installation download the Meanwell LED Lighting Waterproof Series and MeanWell Installation Notes. For information on power supply installation and terminology download the MeanWell User Manual. 4. All LED Power Supplies will auto-recover on over-load or short-circuit. All power supplies will shut-down and need to be powered off and on to recover from over-voltage. Some also shut-down when over-temperature. See data sheets. 5. For information on installing downlights, please refer to regulations in your state or territory. For information regarding "Safely Installing Downlights" (page 3) and "New Wiring Rules" (pages 16 & 17) - click here. 6. For information on the HLG range Option D, timed dimming function - click here. The option can be supplied ex-factory to customer order and provides dimming of the LED output at fixed time intervals. This is particularly useful in street lighting where significant energy savings can be made! This timing function could also be used to "kick start" a motor at maximum torque and then reduce the speed as required over time! Procon Technology and Meanwell are happy to work with clients on their quantity application where special requirements are needed. e.g. an external thermal senser on LED lighting that reduces the current output at high temperatures! 7. For a video on LED power supply operation, circuitry and considerations - click here. NOTE: An additional method of calculating the MTBF, the Telcordia/Bellcore SR-332, is given on many LED power supplies. This is considered a more accurate method of determining the MTBF then MIL-HDBK-217 for commercial products. 'Mean Well' may be a name that is unfamilar to you. Many large companies that supply a wide range of electronic equipment have their power supplies manufactured by Mean Well. Some of them simply rebadge the MeanWell product and sell it for significantly more! As for the name itself 'Mean Well' or 'MW' should stand for 'Manufactured Well' but the name, which was translated from Chinese, means more than it's dictionary definition - 'to have good intentions'. It may, or may not, surprise you that Mean Well Enterprises has adopted Confucius Analects as part of its corporate culture, 'Honesty and Sincerely', 'Active and Responsible' and 'Harmony and Unity'. The message from the President (Mr Jerry Lin) illustrates the importance the company places on the operation of a humble power supply - "If the CPU is the brain of a system, the power supply is it's heart, and often the value of losses incurred in a single failure can exceed the value of the power supply itself." Note, Meanwell has been awarded the 'Taiwan Superior Brands' title for 2010... click here, they have also been awarded the "Taiwan Excellence Product Award" for the HEP, HLG, HVG(C), LCM and LPF series power supplies. Meanwell has won the 2019 'Taiwan Excellence Award' for the LDPC-50A (Laser Diode Driver). Procon Technology is happy to provide any in-stock power supply to government, semi-government or large Australian company 'on-approval' for evaluation and testing over 30 days. Remember OEM, wholesale or re-seller and quantity discounts are available. Disclaimer: The above specifications are subject to change without notice. Please ensure the suitability of these products for your application before purchase. Procon Technology will take no responsibility for poor or incorrect power supply (transformer) installation or wiring. These power supplies can be used in applications other than LED lighting such as battery charging, driving motors etc. however external protective devices may be needed in such applications. In applications where mains surges may occur (e.g. due to lighting strike) additional protective devices should be fitted... such as the Meanwell SPD-20-240P. Some FAKE Meanwell power supplies* have also been sold by overseas suppliers - BEWARE! Always purchase from an authorised Australian Supplier! That way you'll be able to make a warranty claim if necessary and you'll also be assured that the power supply meets Australian Standards or has the necessary Electrical Safety Approvals AND works properly without interference!